BMW did it first, and going by the fact that the X6 is still around there must be quite a few people who like the formula. In fact, there must be such a large number of people who want their SUVs to be coupes (or is it the other way around?) that Mercedes has now come up with this, the GLE Coupe. Is it necessary? Not in the slightest. But to be fair, since when has anything with an AMG badge on it been anything but a sinful indulgence? So here we are, with the GLE 450 AMG Coupe being the first mid level AMG performance car in India, a semi-AMG if you will (an SMG? Sorry, couldn't help myself there). It's a machine that's fast, loud and exciting but not as extreme or expensive as a full blown sportscar from Affalterbach. Let's indulge, shall we? Before we delve into the visuals, I'd like to clear up this car's name. Standard Merc road cars feature the name Mercedes-Benz followed by a three digit suffix - think A 200 or E 350. Then, the chaps at AMG get their hands on these cars and in the process of turning them into blisteringly fast sportscars, they change the name to Mercedes-AMG followed by a two-digit suffix like A 45 or E 63. 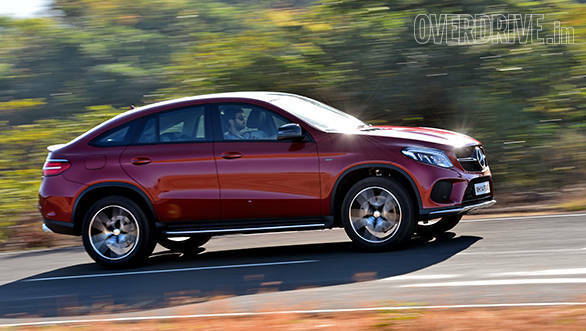 Now the GLE 450 AMG Coupe, with its enormous name, sits in the middle ground. The GLE 450 gets AMG-tuned brakes, suspension and drivetrain as well as some visual trim but all subdued to a milder extent than the full blown GLE 63 AMG. It remains a Mercedes-Benz but earns an AMG at the end of the name to identify the specialness. It's very striking - there's no doubt there. People stop, stare and some even shout out when they see it fly by. The bold face is my favourite angle, its full LED headlamps generating an aggressive air. 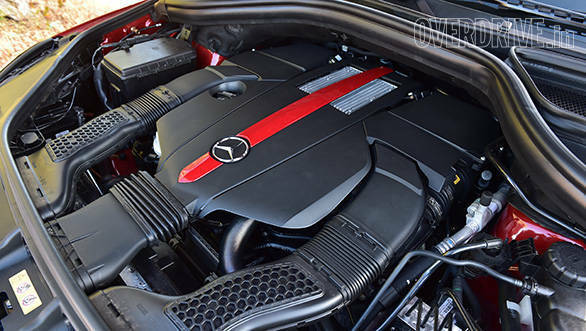 The bumper gets a milder form of the AMG-flared air intakes while the grille gets a butch blacked-out theme. Then we come to what this SUV is all about, the side profile with its sloping roofline and huge wheel arches filled with 21-inch rims. Unlike sportier cars like the Audi RS 7, the wheels are wrapped in more practical rubber with a decently generous sidewall that should hopefully prevent them from disintegrating on impact with a pothole. It happens far too often with these ultra low profile tyres. The rear end gets AMG signature quad exhaust pipes and large tail lamps with some lovely LED detailing that looks striking at night. In fact, the rear end takes quite a bit of influence from the handsome S 63 AMG Coupe. The GLE does a fantastic job of grabbing attention but it's not really what I'd call a traditionally good looking car and I don't much care for the high waistline and that Kardashian derriere. The cabin is very similar to the GLE 350 we drove this year but with some AMG garnishes. Like the standard GLE, it gets a revised dashboard with a new display and a C-Class like Comand controller. Beside the controller lie Drive mode buttons that allow you to adjust the suspension firmness or engine set-up. The seats in the GLE 450 are wide and plush but with good support; a nice middle ground between the sporty but firm AMG seats and soft and cushy standard SUV seats. Rear kneeroom is very generous but the sloping roofline cuts headroom. It isn't too intrusive but tall passengers will find their heads touching the roof. 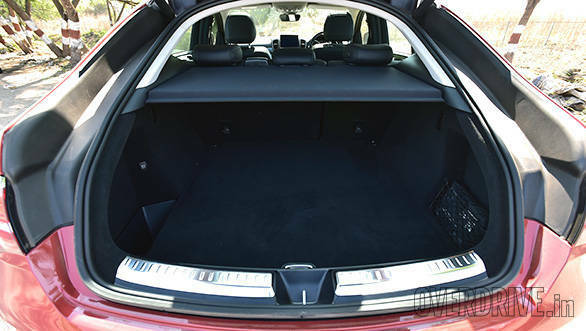 Despite the dropping roofline, bootspace is cavernous at 650 litres. The undoubted star of the GLE 450 is its lovely engine. We've experienced the motor before in the E 400 Convertible but in a lower state of tune. Where the E 400 had 333PS and 480Nm, the GLE comes in with 367PS and 520PS. The bigger difference is the change in character. 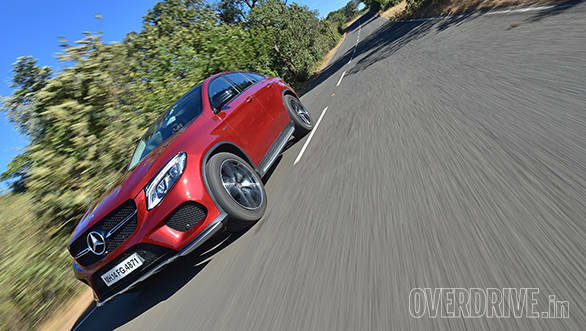 The E felt calmer and more refined while the GLE motor is brash and angry and a lot more exciting overall. It's also seriously loud, almost antisocial in Sport+ mode with a loud crack from the pipes at every upshift and every time you lift off the throttle. The sound is obviously synthesised and Suresh, who wasn't very fond of it, said it sounded it a plastic bottle being crushed under a car's wheel. I think it sounds pretty cool and you can always turn it down by selecting Sport or Comfort mode. No matter the mode though, the GLE always sounds sporty and its signature six-cylinder track filters into the cabin at all speeds. We can't wait to experience this motor in something sharper and lighter. The upcoming SLC 43 AMG is looking to be quite delicious indeed! The motor isn't all bark, it has a supremely strong midrange and pulls hard to the 6,500rpm redline. 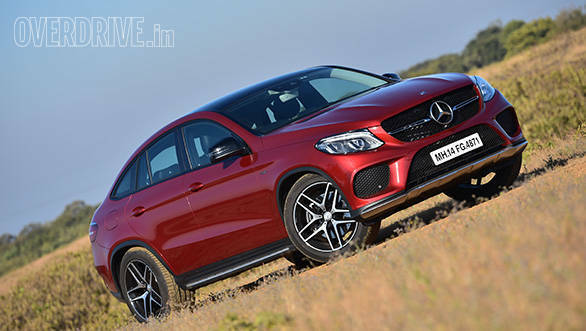 It's powerful enough to haul the 2.2 tonne GLE from 0-100kmph in just 6.1s and on to a top speed of 250kmph. The engine sends power to all four wheels via a new 9-speed automatic. This is the same gearbox we've experienced in the Range Rover Evoque and the Land Rover Discovery Sport but the GLE 450 has the best version I've encountered yet. The gearbox is quick and snappy in Sport mode and smooth and subtle when in Comfort mode. The extra ratios also help reduce fuel consumption and we recorded an overall 7.25kmpl (9.8 for highway/6.4 for city) which isn't bad at all for something this big and heavy. In a machine like the GLE, the 9-speed auto makes perfect sense. What's immediately likeable about the GLE 450 is that every ride is not going to conclude with a potential visit to the chiropractor unlike a certain smaller AMG SUV. 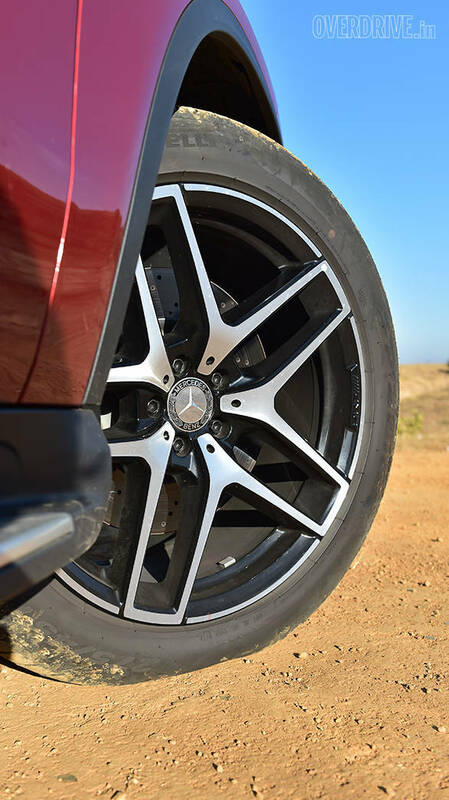 The GLE 450 rides on self levelling air suspension that has been tuned to feel closer to a full AMG rather than a run-of-the-mill GLE. It's quite supple in Comfort mode but nowhere close to as soft as a stock GLE. As you move into Sport mode, the suspension drops by 15mm and becomes a little firmer while Sport+ lowers it by a whole 55mm and firms it up even more. Pleasantly, even Sport+ isn't rock hard and I found it quite a joy to use on the smooth road to Aamby Valley. 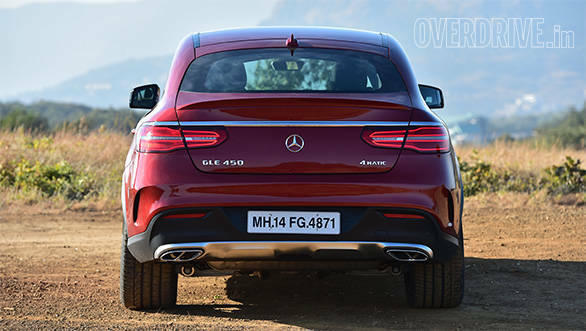 With 275-section tyres up front and gigantic 325-section rears, the GLE 450 AMG Coupe has a huge amount of traction. With so much grip and all-wheel drive, traction control almost never cuts in, but when it does it cuts power significantly until the system thinks the car is back under control. The ESP system in this car is tuned more like that of a standard road car and when engaged, it is more intrusive than something you'd find on an AMG sportscar. It is a very large car though and can only hide its mass so much. After a few minutes of hard driving, I found the brake pedal starting to get soft in the battle to slow the beast down. The GLE is very fast but prefers to flow through the corners rather than piling in at maximum speed and torturing the brakes at every bend. 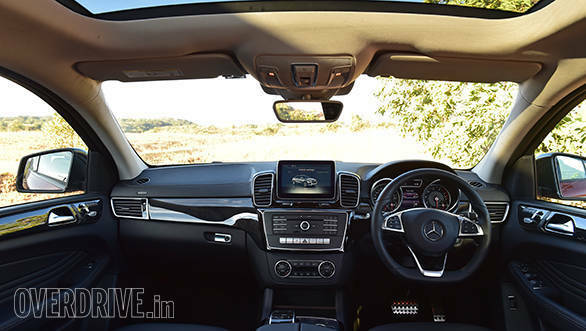 The GLE 450 is comfortable enough in the real world and offers a commanding view in traffic that reduces some of the anxiety of driving such a big vehicle in a city like Mumbai. It has practical ground clearance and even has a Lift mode in the air suspension if the need to off-road ever arises. On the highway, it settles into a steady cruise but has a tendency to transfer the impact of a pothole or bump from one side of the car to the other. It's a strange sideways jig that doesn't change the car's line but can definitely be felt by the passengers. It is most prevalent in Comfort mode and is one of the only issues I have with the way the GLE 450 drives. 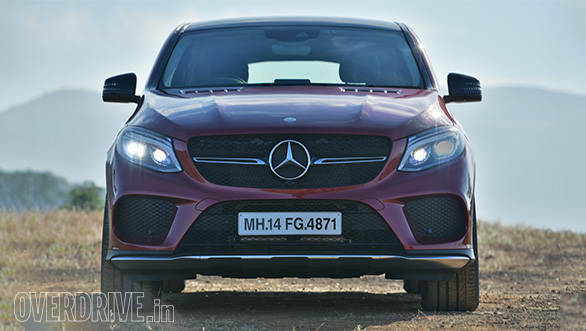 The GLE 450 AMG is a great package for India. It has more than enough performance and feels exactly how you'd imagine a sports SUV should. It's also quite practical for our road conditions and should work well as a daily driver. 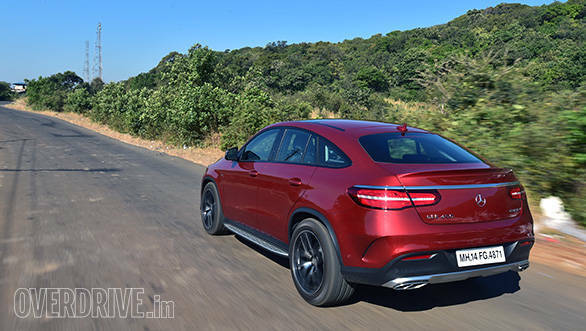 Priced at Rs 86.4 lakh ex-Mumbai it is significantly more affordable than what the Rs 1.5 crore ML 63 AMG cost when it was on sale (it will soon be replaced by the GLE 63 AMG). Its direct rival, the BMW X6 only comes with a diesel engine, albeit a rather powerful one but costs a staggering Rs 1.15 crore ex-showroom. For the money, the Mercedes is a very good deal and is a sportier and more engaging experience, largely thanks to its jewel of an engine.